Join us at our favorite watering holes, drink free craft beer, eat great food, listen to a podcast, commune with 100+ fellow Twins fans all while a Twins road game is on TV. We're releasing this special 5-event season ticket package for one month at just $11 per event. You’ll get a free craft beer. You’ll get another free (or Bogo) craft beer for a future visit. There will be giveaways at first pitch and last out. We’ll play Last Fan Standing, where you compete against Aaron and the crowd to win a great prize. Yet MORE prizes for tweeting about the event or just being social with your fellow Twins fans. Aaron and John will talk Twins and answer questions to the assembled crowd and it will all be on a special release podcast. Your question could be featured on the podcast. If you buy a season ticket package, you can get a free 2019 Gleeman and the Geek pint glass absolutely free. Below you'll see the 2019 Gleeman and the Geek pint glass and anyone who buys a season ticket gets one. These are ONLY available if you buy a season ticket, not an individual event ticket. They’ll be available at whichever event you first attend. Unfortunately, you can’t just arrive at the door, as we expect to sell out and these taprooms have a limited capacity. You can buy a five-event season ticket or individual tickets. If we have room at each taproom, individual event tickets will be sold for $20. They will go on sale about two weeks before each event. Two years ago we were not able to sell any individual tickets, but last year we were, and that has something to do with the capacity of each taproom. The only way to make sure you can attend the events is to get the season tickets, which are also a huge bargain. Buy them here! Today you can buy a five-event season ticket. They're close to half-price and less than the price of the two free beers you get! 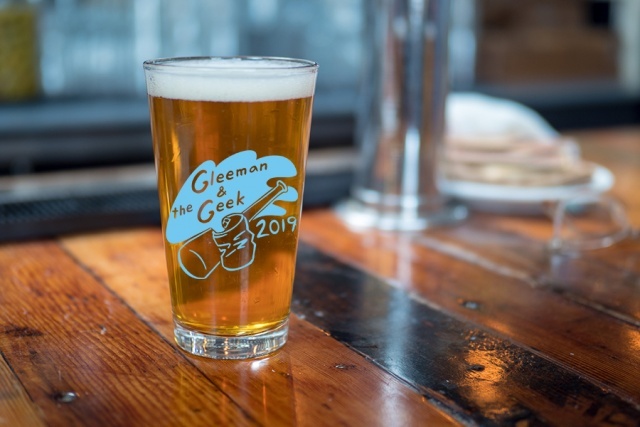 Plus you get the 2019 Gleeman and the Geek pint glass. Buy them here. Don’t get shut out! Get your tickets right now. We’re excited to hang out with you. Will Animales be open at Able during the event?